Plywood is known for its strength and value for money, but it can also be a beautiful material for furniture-making. Made up of criss-crossing layers of wood veneers, plywood ends up stronger than wood as it distributes along-the-grain strength in both directions. Although it's been around for much longer, its aesthetic qualities were first put to use in the forties and fifties by American furniture designers Charles and Ray Eames and as well as Danish greats Arne Jacobsen and Hans Wegner. Over half a century later, plywood is having a renaissance. A quick Pinterest search reveals endless modern furniture ideas, and companies such as Uncommon Projects, Make Furniture and Plyroom are all championing plywood design. So why is it making a comeback? Plywood can be bought in many different wood veneers including oak, cherry, walnut and cedar- all woods which are known for their grains and colour. In short the same aesthetic effect can be achieved with a much cheaper and more durable material but the advantages do not end there! The standard thicknesses allow for different woods to be easily combined. The flat surface means that plywood can be evenly painted for a more fun finish. And finally, my personal favourite thing about plywood furniture is that rather than try and hide the edges (as you might with a veneered panel) the visible wood layers can be great to break up a piece of furniture. Putting a bevel or a round on the edge of plywood can bring this out even more and make for some really interesting design. The humble plywood has made a welcome return! Sometimes, one can become so embroiled in the search for the perfect elements of a room that it’s possible to overlook the room’s general impression. When your space needs a makeover, the layout is just as important as its shades and furniture. It’s possible to create a whole new aesthetic just by adding a piece here and there, and doing some rearranging. So how do you go about reshaping the room? It could be a beautiful window, your fireplace, or even the TV. Think about what you want to face from your favourite seat; and what you want your guests to face. The focal point doesn’t necessarily mean that all of your furniture needs to face the same way, but it will steal the focus of anyone entering. If your fireplace is grand, then don’t hide it away. If your windows are low, use lower profile furniture. Will your guests need to put drinks down in this room? Will you need somewhere for your books, for your makeup, or your computer?. Are you a bookworm who’ll continue to buy editions? Then you’ll need to consider the shelving and find the right place to show off those well-worn covers. Perhaps your children need a homework area, or a toy box? Keeping the space beautiful is important, but before you can consider the best arrangement for this, it’s imperative you consider its functionality. What’s the journey like into your room? Do you casually hang up a coat before taking a seat on the couch? Remove your makeup before getting into bed? Read while you’re in the bath? All of these aspects should be considered when creating the perfect space. Your home is your sanctuary, and making life easiest for yourself should be your number one goal. As you use the room, make a mental note – or even a physical list – of what you do when you enter, and how your journey in the room unfolds. Take that step-by-step process and think about what you could do to make it easier. A hallway could use a shoe-rack, for example. A bathroom could have a keenly placed magazine holder; or a dressing table could position itself en route to your bed. Once you have all of these considerations in mind, it’s time to take a moment to properly plan the room. Software or apps can make this a piece of cake – but a rough sketch on paper is just as good. Take inventory of what you have in the room – and what’s getting the boot – and make sure it all has a helpful place in the space. You can then allow for any extra storage or surfaces. When this is done, get shifting! And enjoy your new-found comfort in familiar surroundings. We are happy to announce that our Director, Duncan White has become a member of The Guild of Master Craftsmen. The Guild represents over 400 different crafts, trades and professions, promoting and supporting excellence. We are particularly proud to become members, because excellence is something we strive for at every step of our work processes. Duncan, his work and commitment to customer care, were all thoroughly assessed to earn the right to be called a Master Craftsman. Going forward, he is required to maintain the Guild’s stringent professional criteria. So now that we are recognised for being a master of our craft, you will see the Guilds Emblem on our website. Our pieces will continue to reflect our passion and dedication to furniture making, and we are excited for what we have planned in 2017. Christmas time is upon us, and it is safe to say everyone is excited...and busy. You've got a lot to do, presents to buy and mulled wine to drink, not to mention decorating your home. We thought we would simplify things a little and show you our festive favourites that will make your home look fab in a flash. Adding a little bit of nature it a great way to decorate in the festive period. It can bring in colour, fragrance and is really easy to do. You can gather foliage from outside, snip a little branch from the tree (no-one will know) or buy some from your local garden centre. Collecting pinecones with the kids will always be a fun activity! You can bring a huge range of colours into your décor with these glass ornaments. They are classic and elegant and will fit into any theme. You can even carry the outside theme, by getting ornaments you can fill yourself and adding a little of your found foliage! If you have any tiny humans that are likely to be playing catch with the baubles before the big day, you can swap Glass for Plastic and get the same effect. Gold is traditional and a Christmas colour that will never go out of style. Glittery Gold is the glamourous cousin that elevates your decoration from standard to fabulous. A wreath on the door has always been a standard, but we are loving this years trend of going all out in the entry way of the home. 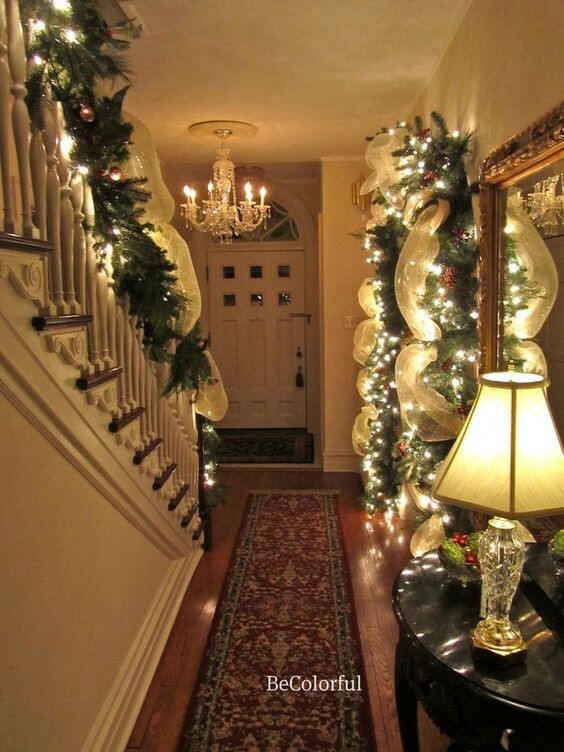 Even if you have a modern tree, a traditional welcome into your home sets an exciting tone for guests (and you!). Whether you have a tiny porch, or a huge hallway, think Mistletoe over the door, garlands along banisters and lights in the window. When I’m commissioned to make a piece of furniture, I’m often asked to make it from solid wood. There seems to be a real preference not to use man-made materials in fine furniture. Now for certain pieces, solid wood is the only viable option. Take, for example, a huge dining table made, say, from a single cut through a walnut tree with the live (waney) edges still attached. Perfection! Solid wood, however, does continue to breathe and move as long as it exists. So, in today’s centrally heated, dry houses, this can be a problem, causing shrinkage and cracks. An excellent solution is to apply veneers to stable substrates such as plywood or MDF. The finished article can resemble solid wood very closely and does not suffer the iniquities caused by the dry heated atmosphere in which we live. Veneers use a very small quantity of the original timber which helps preserve scarce resources and allows us to build furniture from any wood at a much more affordable price. Veneers can be “book marked” using alternative layers from the same log, making each section mirror the pattern of the previous. For doors and drawers we can also add a lipping to the edge in the original wood, providing a thick durable surface, that adds to the longevity of the piece. In short, veneering allows fine furniture suited to our modern living, to be made in a multitude of wonderful, varied woods. Decorating your home is a minefield. There is just so much to consider, and right at the top of that list is furniture. New furniture can completely transform a room so it is important to really consider your purchase and choose the very best that you can afford. Some of the things that will be racing through your head when picking new pieces will be size, style, materials, whether it suits other pieces you have, versatility, budget……. what you might not think about is whether you are going to go off the shelf, or bespoke. Often people assume they will purchase a pre-piece, without consideration as to whether a bespoke option would suit their needs. Here we will look at the pros and cons of both, to help you decide how you should purchase your next statement piece. An off the shelf piece is furniture is available for immediate purchase, from a store or online. There are several benefits to this form of furniture. You can usually take it home immediately. You can view the piece before you purchase it, feel the quality and get a good understanding of how it will fit in your home. Now a days the choice of furniture is vast and you can have your pick from a number of designs to suit your tastes. That said, your piece can never be unique or personal to you. The mass production of furniture started in the nineteenth century, but didn’t come into its own until 1950, when IKEA designed flat-packed furniture which could be easily transported for sale on the mass market. This furniture can be fabulous and I know my home certainly has plenty of these pieces – my ten year old daughter’s IKEA homework desk works a treat! That said, I strongly believe that when you need a key piece of furniture, bespoke is the only way to go. I daresay I am biased; however, I just don’t believe that factory built furniture can come close to comparing with a handmade piece. The craft of furniture building dates back to the year 782, and the skill to bring something together really is a beauty to behold – even in the workshop before completion. You also get something that is completely unique to your style. You can make something to fit an award space in your home - choosing the exact size, colours and material of your furniture. It will be something that is truly yours and completely unique. Due to the level of craftsmanship it will also likely last longer than a factory-made piece. Of course, there are some negatives to a bespoke piece, it can take much longer to produce – for instance looking at our painting process we put 3-4 coats of paint on a piece with a day’s break for the paint to dry in between each coat . It is also, of course more expensive. Thetime taken to design it to your specifications and the level of skill and time to produce it are much longer for a handmade piece of work. So what to go for? My firm belief is that a combination of both off the shelf and bespoke is the best option. Splash out on a few pieces of furniture that you truly love and perfectly fit the look and feel you want in your house, and you will never look back. As we head into the winter months, the comfort of our own homes becomes ever more alluring - and ensuring your interior is a welcoming and warming environment is an important way of enveloping ourselves in comfort. Precision engineered bespoke furniture requires a precision engineer. Duncan White takes the utmost pride in creating beautiful pieces, underpinning this with an unparalleled attention to detail. Hello! And welcome to our brand new (and long overdue…) blog.